Remove front wheelhouse liner extension right side. Refer to Front Wheelhouse Liner Inner Front Extension Replacement. The crankshaft balancer can be incorrectly installed 180° from the required position. Be sure to note the location of the alignment hole on the crankshaft balancer prior to removing the crankshaft balancer from the engine. 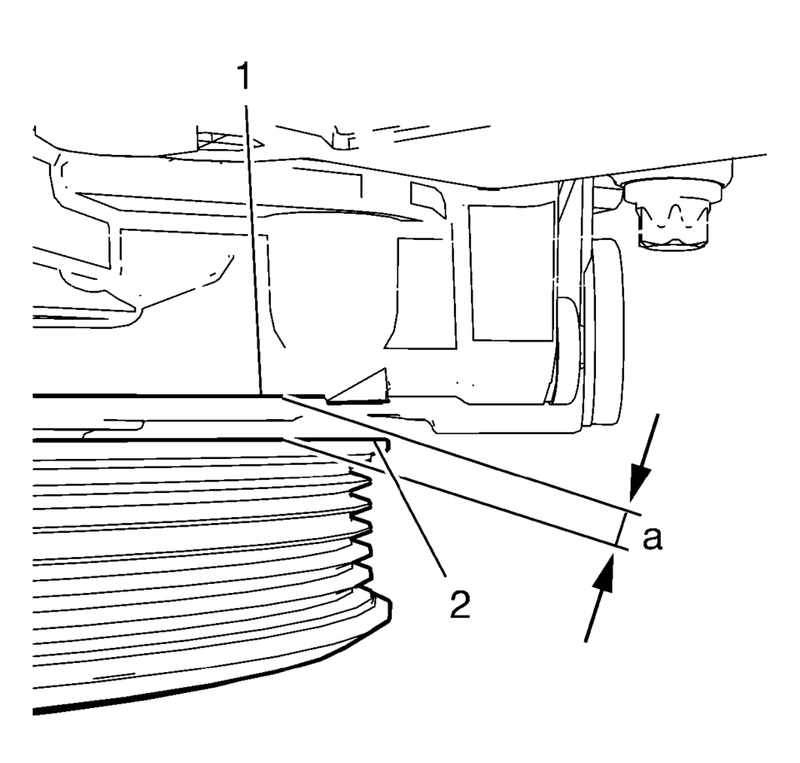 Rotate the engine clockwise until the bore (2) in the crankshaft balancer aligns with the mark (1) on the engine front cover. 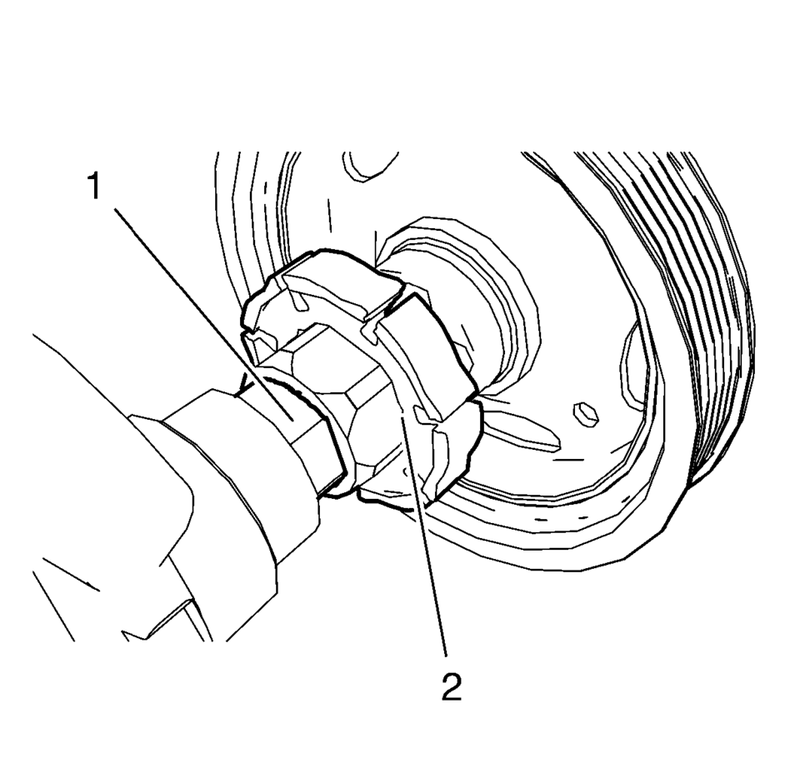 Install EN-49979 crankshaft shock mount retainer (1) to suitable tool (2). 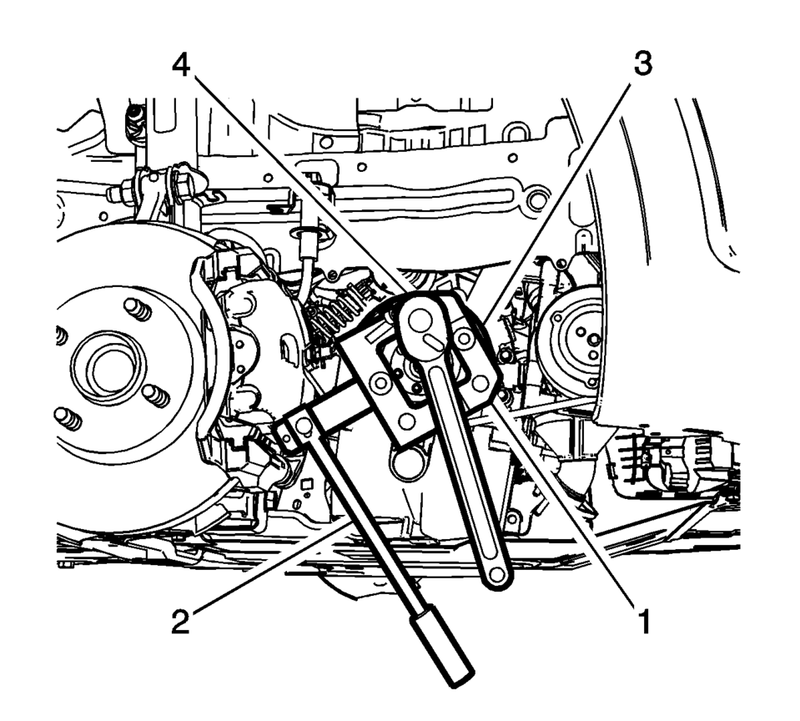 Loosen the crankshaft balancer bolt (4) while holding the crankshaft balancer (3). 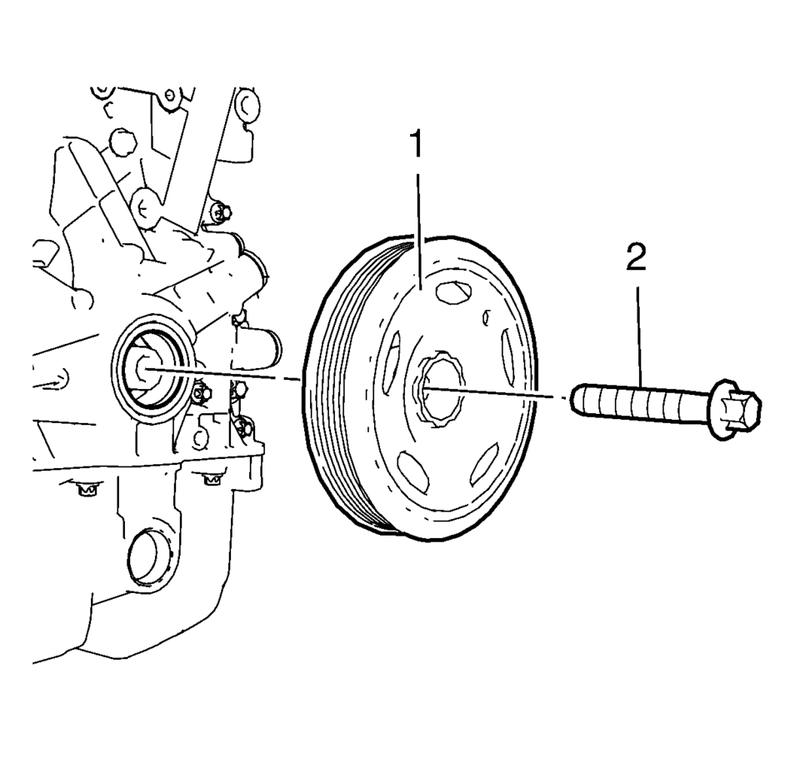 Remove and DISCARD the crankshaft balancer bolt (2). 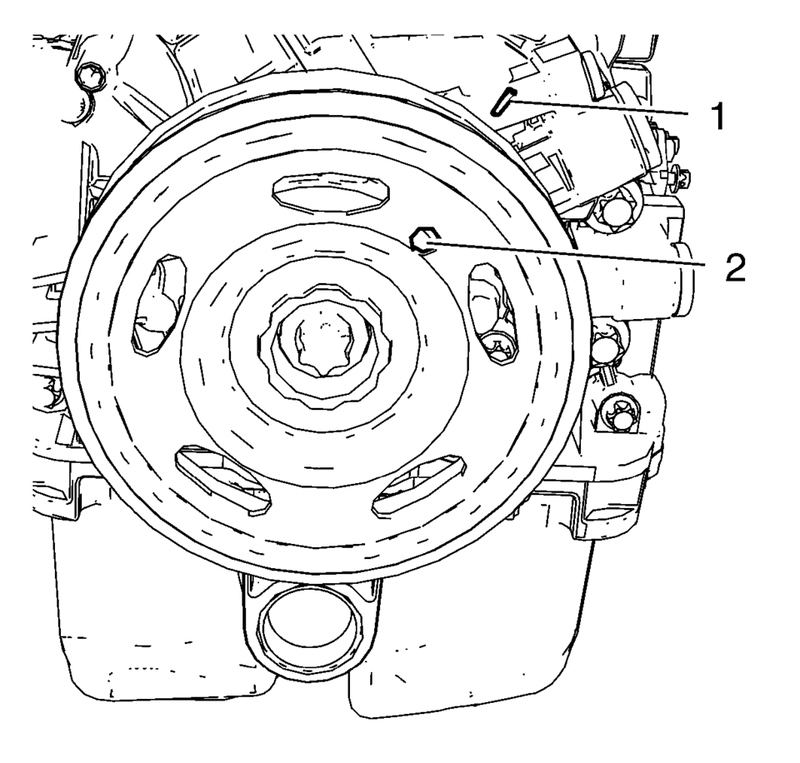 Remove the crankshaft balancer (1). The crankshaft balancer flange must fit to the hexagon of the oil pump rotor (2) and to the two-flats of the crankshaft (1). The TDC markings on crankshaft balancer and engine front cover must match. Install the crankshaft balancer carefully by pressing into position. Never re-use the crankshaft balancer bolt. Tighten the crankshaft balancer bolt (4) to 150 N•m (111 lb ft) while holding the crankshaft balancer (3) with EN-49979 crankshaft shock mount retainer (1) and suitable tool (2). Use EN-470-B wrench . Install the front wheelhouse liner extension right side. Refer to Front Wheelhouse Liner Inner Front Extension Replacement. Check and correct engine oil level.